Our document carrier s flat design saves space and is easy to store. And it is a convenient style to carry under your arm. Rigid interior panels keep materials flat. 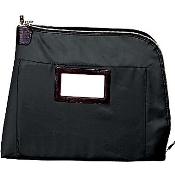 7-pin lock provides maximum security, and laminated nylon is durable and waterproof. Pick-resistant zipper curves around bag to simplify content retrieval. Silk screen imprint included (one color/one side). Use I.D. window and address card to route bag. Includes two keys, which is ideal for multiple users or spares. Please allow 3-5 weeks for delivery. Need it faster? Click here - In-Stock Document Carriers ship in 24 hours! Select Keying Options option Keyed Differently Keyed Alike Keyed Differently w/Master Key (Add $1.50) Please call me to match to an existing key system.